Semi Annual Workshop Sale! wahoo! OH but before I give you all the Deets! I have a winner to announce from the Giveaway last week! You have won a spot into Juliette Crane's "how to paint and owl No.2" workshop! Email me at christy@scarletlime.com so I can send her your info! Now is a GREAT time to either renew a workshop that you are currently in (even if your time isn't up on your workshop, this will extend your workshop an additional YEAR from the time it will end). OR purchase a workshop you've been waiting to take.. OR even gift it to a friend, a family member.. PERFECT For Mother's day! Someone who you know need creativity in their life! ONE: If you want to gift this this to a friend, you cannot leave those comments in your paypal notes. THEY WILL NOT reach us. You must contact Jen at customerservice@scarletlime.com and let her know the name of the workshop you purchased, YOUR full name, and your paypal email. AND the name and email of the person you are purchasing it for. TWO: the welcome and log-in emails GO to the email associated with your paypal address, so keep in mind if you pay with a business account, and old paypal account or a husband paypal account, it will go to that email. IF you would like it changed to go to a new email, again.. just simply email Jen at customerservice@scarletlime.com let her know THE FULL name or business you paid with, The name of the workshop or workshops,and the email that was ON the paypal account. Then give her the full name, and email of the NEW email you want it to go to. She has to go in into the workshop data base and find your payment, edit your account and switch the names, and users, and emails, and then reset the password. So if she doesn't have the original name of who was on the account, etc. She can't do that. THREE: Jen does all of my workshop logins for me. She works Monday, Wednesdays and Friday mornings. So it can take up to 48-72 business hours to receive your log-in. If she has already done it for the day, then you won't receive it until the next day she works. Also keep in mind any email or questions you have about the workshop log-ins, etc. Email her! FOUR: If you are wondering how much longer you have on your workshop, the easiest way for you to find out is to go to your paypal account and do a search for when you signed up and paid for the workshop. OR find your original welcome email and look at the date. Workshops are good for one full year. Thank you again.. TRULY thank you again for your wonderful support!! You guys simply rock. I am always blown away by your support! Hey friends! wow.. I really need to be better at this don't I? well today I have a couple of just fun things to share that some of my dear friends are involved in and a giveaway too! How's that for a thursday? I wanted you all to know that NEXT Monday is our semi annual "workshop" sale! what does that mean? 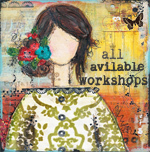 All of my workshops (with the exclusion of these 3 spring workshops).. will be on sale! Most of them HALF OFF! so.. if you have been thinking of signing up for one of my older courses.. WAIT until monday!! When the sale is on! Gelli Plates, Faber Castel Pen (the famous white pen and more colors too), Ranger Sprays, and all of Claudene Hellmuth's paint, and Lots of Crafters workshop stencils, PLUS my products too are back in stock as well as TONS of other items (Like liquid glaze, modeling paste, Matte mediums, charcoal pencils, etc.! So just wanted to let you know for those of you that have been wondering! Second, I wanted to let you know about this fun little art retreat I am going to in June. Last year when I heard about it, I signed up before it even went live to the public! lol. I mean I seriously emailed the girl begging her to let me sign up early because it was THREE of my most FAVORITE artists all in ONE place! Artology Retreats will be hosting a Summer Retreat called Sugar & Spice! The three teachers are Juliette Crane, Danielle Daniels, & Mindy Lacefield! seriously?? is that like a dream team or WHAT?? you want to know the OTHER best part? Ben and I are going together! We were looking for something unique to do for our 19th anniversary.. and GRANTED these are three girls (totally different than taking a class from Jesse Reno), but I think still he will enjoy their styles and make it his own! He and I can learn SO much from these brilliantly talented girls! It's June 5th-9th and I think she only has a few spots left! It's in the Cute little city of Port townsend right out of Seattle (actually SUPER close to where the retreat was I went to last month). So I am really excited to go back and show ben the beautiful ocean and island. I can't wait! Anyhow.. really the reason I am telling you is that I THINK you should come too AND bring your husbands So my benny isn't the only guy! haha. No but seriously.. how fun would that be! I would love it! If you want to find out more about it, You can visit the Artology website, Here.. She also has a facebook page! One more thing before the giveaway.. As you know my Behind the Art Class started this week (don't worry you can still join!!).. BUT another class started this week too.. my dear friends, Jeanne Olivers new class, and it is FREAKING awesome! MAN oh man she has jammed packed this class with goodness. ARTSY wonderful goodness! I can't WAIT to get into this workshop! She is so utterly talented. I was blown away when I took the class from her in March at the retreat in Washington. OH my gosh.. in LOVE with this girl even more now! So if you are looking for another online class to do, to keep you busy through the summer, THIS one is great! Check it out of you have time! Not to mention.. she has this AWeSOME new Ning site community. Oh my gosh in love with it. Basically this wonderful creative space she has created for women to come and chat and share and bond! Her Creative Network, offers free tutorials and classes in the community. It's truly fun. I spend time on there and fall in love with all that she offers for FREE on it! So check that out too! So onto our giveaway.. this is about another AWESOME class that just started.. by one of my "favorites" that I stalk lol. Ms Juliette Crane's new class, How to Paint an Owl 2! Juliette's sweet owls were the very first thing I fell in LOVE with about Juliette! I took How to Paint an Owl last year and LOVED the course! So fun! She is giving away a spot on my blog today.. all you have to do is comment on the post and you are entered! I will pick a winner next week! Simple as that! so fun! So make sure you go check out Juliette's website too for more info! But here is a fun little video she did about the class! How to Paint an Owl 2 with Juliette Crane from Juliette Crane on Vimeo. So thanks for letting me share, thanks for putting up with me being so flighty latley with the blog. Just Overwhelmed and understaffed (I can't seem to clone myself, so there are two of me? when is that going to happen? lol it's 2013? I thought for sure we would have cloning down by now :)) jk. well you all have a FABULOUS weekend! i am working on a project I saw on pinterest, that I am doing JUST for you gals! It's a fun idea on how to make your own roller stamps! I saw it and thought, dang this would be so fun and DANG the girls (and guys) who read my blog would LOVE to do this too. So Ben and I went and bought the supplies for it last week and I am going to try and get that filmed sometime in the next week or two. I leave for California NEXT week to go teach, so might not get done before then, but it's SO fun I can't wait! anyhow.. Hope you are all well. I am also going to be doing a blog post next week on my fibromyalgia and the oils and things I have been using for it that have been AMAZING. I get emails daily about it and so thought it would be good information to share on the blog, so that everyone has access to it! I post things here and there on facebook about it.. but it would be great to have it all in one place! anyhow.. have a FABULOUS weekend! It's April?! Happy April 1st! It's just been crazy busy. BUt isn't life? So today is April 1st.. My kids always love this day because they think it's the day they can pull any prank they wish on us and not get into trouble. lol. I guess that is true right? My husband is like a little kid as well, always coming up with some funny joke to play on me. I am still trying to think of something I can pull on my kids.. it's so hard because a few years ago we got them SOO good. I mean like crazy good. We sat them down and told them that we had been called on a mission by our Church (We are LDS), To serve as mission president over a area in China and we would be moving to china in 3 months for 2 years. It's not uncoomon for our Church to ask a husband to serve as mission president over a mission area, with that, the entire family goes with him. It's at his own expense as well, and ben I would have always dreamed about the possiblities of us doing it. Anyhow, so We were video recording it and oh my heck.. you should have seen the response! I thought I was going to to pee my pants from trying to hold in the laughter. Some of them were like.. oh cool! that's awesome (the younger ones). But the three older one, freaked out! Told us how they didn't want to go, leave their friends, leave their small town life, Braden leave, and not get to play football for the last 2 years of high school.. Allie having to leave all of her friends and we were so mean. We kept a straight face the entire time and kept saying how cool it was going to be and how in 2 week ben and I were going over to China to find us a place to live. We told them lots of made up stuff.. lol. But still the more we talked about it, the more the older ones resisted and then allie started crying and ran off to her room, Braden sat with his arms folded and head in his lap refusing to speak to us, Parker was freaking out.. and So we finally let them in on the joke. We told them we were just kidding and we weren't really going to china.. and it was April Fools. THEN the funniest thing is that Preston stood up, started crying and ran off.. and said "that's so mean! I thought we were really going and now we aren't!" and then Ethan got upset we weren't either and ran off. The whole time we were recording it and oh my gosh we watch it back now and we all just laugh until our stomach hurts from the drama.. the crying the slamming doors. SO funny. So yeah pretty much since then, it's been hard to pull one over on them. So speaking of what I have been doing these past couple of weeks, like I mentioned I have been filming and getting ready for my biggest Solo workshop yet! Behind the Art! I have to say, this is turning out to be a REALLY fun workshop for me to film. Its actually fun for ME to break fown my process, step by step, product by product. It really has been! I am So enjoying it and actually getting a lot out of it myself! if you haven't signed up for it.. I thought I would come and re-post about it.. you still have one week before it starts.. so plenty of time to still join.. So here's a sneak peek of what's in store! Behind the Art is an ecourse workshop . This workshop is a 5 week workshop!! This class start April 9th! I am TRULY TRULY passionate, excited, and giddy about this workshop because I have to say it will be my most comprehensive workshop yet as far my creating process, what products I use, WHY i used the products, HOW i use them, and more! I will also have a few "guests" in this workshop that will give some insight into THEIR creating process as well! My Guest will be Danielle Daniel, Nolwenn PetitBois, and Junelle Jacobson! I will share with you what they are, what their properties are AND WHY I use them. What instance I would use them in. For example.. why I would use transparent paint vs. opaque.. for a certain look, or in what instances I would choose opaque! I talk about permanent vs. no permanent and the values and GOOD qualities of both. I talk about the primary colors both in Mineral Colors and Modern colors, what the difference is, why one is sometimes better than the other. I will talk about the values, Hues and densities of Paint. Why some paints mix better together than others. Why sometimes a of one kind of paint.. goes much further than a LOT of another. I really go in depth of the art products I use in my creating AND WHY I use them. There will be some videos on creating as well, as i show you what I mean by why I use sometimes one product over another. It will be a GREAT resource guide for you FOR ANY of my other workshops I teach. Or any other workshops period! will be about HOW I used the products I talk about in Week one. I show you tons and tons of techniques, and how to get Similar looks using different products. I show you all the possibilities there are when it comes to using the products.. and hopefully some fun OUT OF THE BOX Ideas you haven't seen before! This week is really in depth about how to use the products for creating. Lots artsy messy videos. This is where the creative process gets REALLY fun. I will show you in depth, how I create, what I call the "backgrounds" of my pieces. Why I change the color of something as the process develops. It will truly by a IN DEPTH look at my creative process! we will take those same backgrounds and then we will finish them by adding objects and all the fun little DETAILS that make it Yours. (I will be painting anything from a girl, to a bunny, a butterfly, a dress, a house etc).. but remember it's not so much WHAT i am painting, but the process of it .. how what and why! Again.. where I place the object and why. Also once the objects is on the canvas, WHY i then add things to the object, or the backgrounds. Why I choose to cover some things up. I will talk about Contrast, depth and color hues.Different techniques i like to use to make certain things stand out.. why sometimes I want others to fade into the background. is going to be the challenge week. This is the week when I will give you a series of challenges using all the information you have learned over the last 5 weeks. I will be doing the challenges as well, and also some of our guests will be doing them too! So lots of fun videos with artsy messy play! It's now time for YOU to have fun, for you to create, to explore, to mess up, to have "oh i love this" moments! It's TIME TO STRETCH THOSE WINGS!!!! This workshop will be open for 2 FULL years! That way, when you are taking other courses.. mine or even other artist.. you can always come back to this one for reference when creating! This workshop will be FILLED with videos and printable PDF"s so you can take the information you learn and use it while you get messy. hope you join me in the exciting, heart filled class. I hope you that by taking this class, it will open up an ENTIRE new world for you of possibilities. Both in creating AND in your finding your own unique voice! This class will Catapult you as an artist.. taking everything you've ever learned to an entirely NEW level. If you are really wanting to move forward in your creative endeavors.. this class is PERFECT place to start! It's time to Open your Heart! $59.95 and again you will have access to this class for 2 FULL years! To sign up for this workshop.. click on the link below! (as a reminder your password for this class is mailed out the DAY CLASS BEINGS. You will receive an email from paypal confirming your payment. That will be your only email confirmation from me until class begins on the 9th.